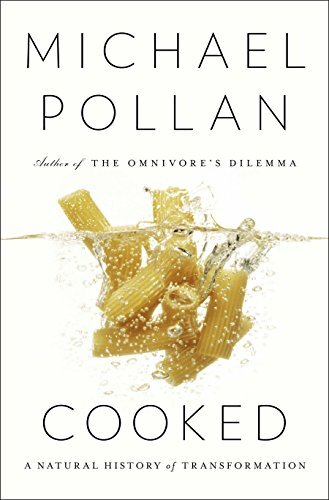 Michael Pollan’s The Omnivore’s Dilemma was a seminal work that changed the way many of us thought about our food choices. At a minimum, it got more of us eating grass fed meat and flocking to farmers markets for locally grown food. Have you noticed how many more grocery stores now carry pasture-raised meat? With the same enthusiasm, thoroughness and sense of humor that he brought to unraveling the complexities of our American food system, Michael Pollan now takes on the various ways we transform our food into a cooked meal. If in The Omnivore’s Dilemma he explores the farm, in Cooked, he examines the table. Mr. Pollan’s main interest is in gaining “a deeper understanding of the natural world and our species’ peculiar role in it.” In the same way that he showed us in The Omnivore’s Dilemma that the natural world provides more healthful food—e.g. a cattle’s stomach was designed to digest grass not corn so it is no surprise that corn fed beef is high in saturated fat whereas grass fed beef is high in healthy omega 3 fats—we need only look back in history to see how we humans discovered cooking as a natural way to make food more digestible and energy efficient. Of course what has happened along the way—or really more recently in our history—is that humans have begun to interfere with the natural order of the world, and cooking has seen a steady decline in American families. Just as the agro-industrial complex has taken over our farms, the food industry has taken over our kitchens. Exploring how we humans naturally came to cook, Mr. Pollan has decided to deconstruct cooking by way of the four elements, fire, water, air and earth. Taking each element separately, he delves into a specific recipe or cooking method: Whole hog barbecue for fire, slow-cooked braising for water, baking bread for air and fermentation (including pickled vegetables, beer, and cheese) for earth. Yet if the idea is to encourage people to cook, explaining the whys and wherefores of cooking methods that literally take all day if not weeks to come to fruition is an odd choice. Not all cooking need consume so much of your time. There is just as much joy in eating a simple piece of freshly caught grilled fish with just-picked asparagus as there is in a slow-braised stew of beef that took all day. Yet while you may never barbecue a whole hog or make your own sauerkraut the way he does, what you learn from him is endlessly enlightening and entertaining. To borrow from the old Dow Chemical Scrubbing Bubbles commercial, Michael Pollan does the work so you don’t have to. (Plus I doubt your spouse will approve of your building a barbecue pit in your front yard the way his did. Talk about yard art!). What you get in Cooked is a complex interdisciplinary stew of chemistry, biology, history, anthropology, sociology, mythology, religion, and philosophy, with a few jabs at the industrial food chain for added seasoning. Which is to say that cooking is at the crossroads of all human civilization. Will you ever eat a stinky cheese again without stopping to think of death? This is the real transformation that is going on in Cooked. Just like in The Omnivore’s Dilemma, Michael Pollan causes us to stop and contemplate what we are eating. As humans we are members of the natural world and there is an order to it. Humans are meant to cook. In part it is what defines us. So why, you have to wonder, do we spend so much time trying to avoid it? Why not embrace it? Cooked is a call to all of us to get back to our kitchens and cook our own food as nature intended. “Eat food. Not too much. Mostly plants.” And cook it at home.